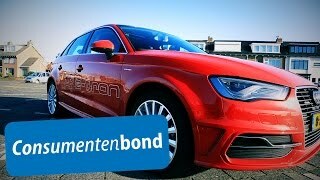 Audi recently commenced its big venture of electrifying its entire lineup, and to add new name in the list enters the all new Audi A3 Sportback e-tron 2015, electrified version of Audi A3. 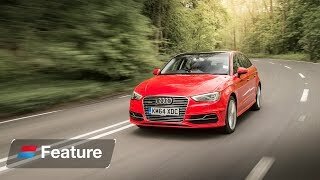 It started back in 2010 with the introduction of Audi A1 e-tron and here we are with the moving time curious to know updates in looks and power. Let us take a step ahead and commence our descriptive look through Audi A3 Sportback e-tron 2015 review. Interior of Audi A3 Sportback e-tron 2015 is pretty similar to the base model however few features have been added to make it feel you distinct being a hybrid model. The series of changes begins with the modification in instrument cluster which now comes with special power meter displaying overall output of system. With the operating ranges and consumption figures the MMI navigation plus system gets an upgrade giving commands in driver’s hand with options to be operated through special iOS or android smartphone. Few more additional features inside Audi A3 Sportback e-tron 2015 includes, climate control planner to maintain the temperature inside prior to your entrance, light and rain sensors, Audi connect online services and rear parking sensors. Exterior of Audi A3 Sportback e-tron 2015 just like its interior is similar to the base model. However to make it look different sides get the A3 e-tron sticker on them. Apart from this, everything is taken from the past including single frame grille, daytime running lights incorporated in LED headlights and air vents in front fender. Another add-on to grab your attention that slipped from our minds but is an aggressive touch; the 17” alloy wheels. Audi A3 Sportback e-tron 2015 hides beneath its hood a 1.4 Liter TFSI engine and an electric motor. While the engine delivers 150 hp and 250 nm of peak torque. However when combined with electric motor, the total system output touches 204 hp and peak torque of 350 nm mated to six-speed e-S tronic transmission. 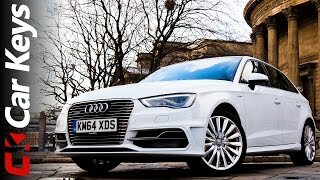 With this power rolling the entire model Audi A3 Sportback e-tron 2015 is capable of reaching 62mph from standstill in 7.6 seconds and maintains a top speed of 137 mph.